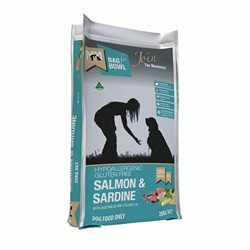 This highly palatable gluten free dry food contains kangaroo, lamb and ground brown rice as its first ingredients. 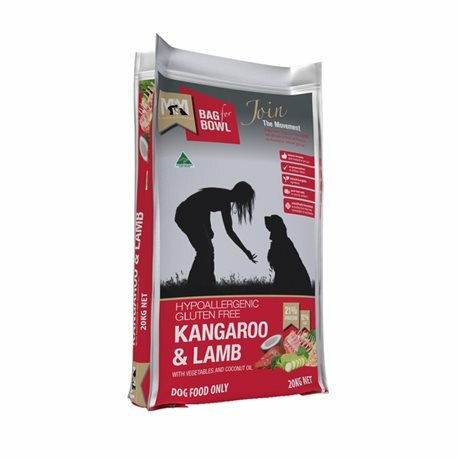 The kangaroo meat has been sourced sustainably, responsibly, and ethically. Kangaroo is highly palatable for dogs, and is very high in protein and omega6 fatty acids, as well as dietary zinc, iron and other minerals. The lamb in this diet is pasture-fed and not exposed to grains. Lamb is a good source of protein and omega 3, as well as dietary zinc, iron and other minerals. Omega 3 fatty acids play a major role in immune and hormonal system function, as well as having anti-inflammatory properties. This diet also contains seasonal vegetables, kelp, and Yucca Shidigera extract, and is preserved using natural vitamin E and rosemary extract. Kangaroo and Lamb meat, seasonal vegetables, ground brown rice, alfalfa, natural fats and oils, omega 3, 6 & 9, coconut oil, turmeric, parsley, pre & probiotic, kelp, vitamins A, C, D3, E, K, B1, B2, B6, B12, niacin, pantothenic acid, folacin, biotin and natural organic acids, plus minerals, calcium, phosphorus, sodium, copper, zinc, iron, manganese and iodine. Also contains Yucca shidigera extract and natural flavours, and is preserved using natural vitamin E and rosemary extract.